Hi guys, there has been so much good stuff coming out about The Chapel this week, so I thought I would finally break cover on what I’m planning for the more eldritch side of my warband. 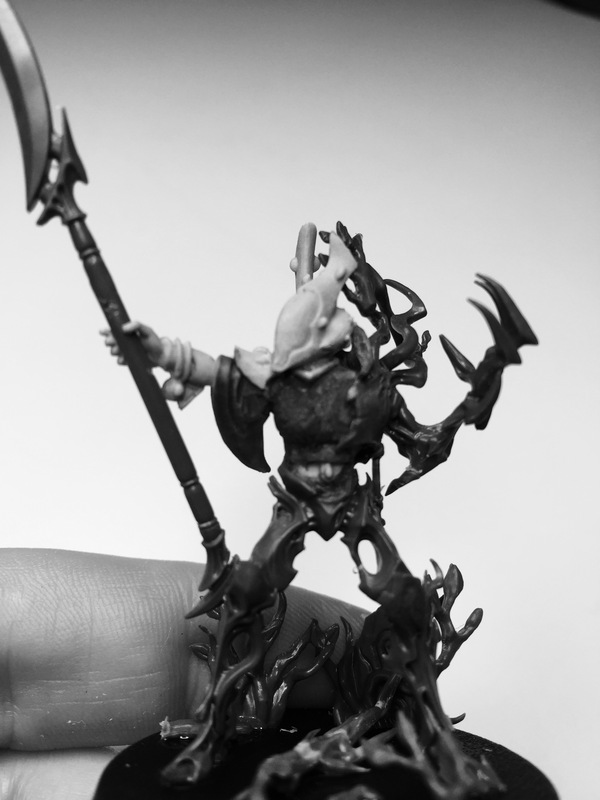 I’ve been diligently learning how to sculpt fur on my Exodite Avengers, but I’ve also had a chance to get the basic build done on the latest warband member – a Spiritseer. I love the idea of Spiritseers and their role in communing with the Eldar dead, and this seems very appropriate given the ghostly theme running throughout The Chapel project. I love that they are viewed as necromancers among their own people, and that they naturally work well with wraith-type troops. 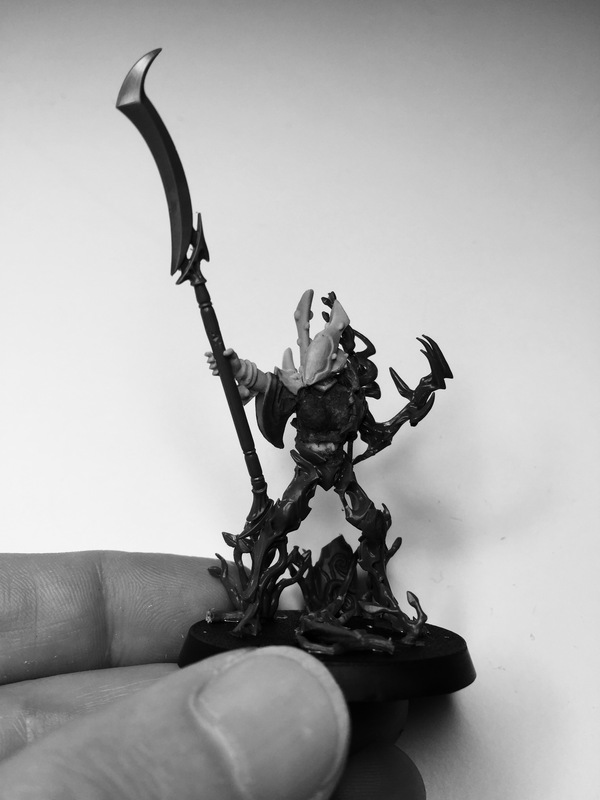 Wraith troops are about the coolest thing about Eldar in my opinion – I just love the concept of towering Wraithbone constructs controlled by the spirits of the dead… I knew I had to have some in my warband, so the Spiritseer became a natural choice. Obviously there is plenty more work to do on her but I’m happy with the direction this is heading… I can’t wait to get stuck in to some of the bigger Wraith troops! What do you guys think of the concept? Win or bin? Thanks mate, I’m so relieved that it seems to be a hit! Putting it together was a nervous moment… It looked good in my head, but that isn’t a guarantee that the model would ‘work’. Of course win, you could never do “bin” in my opinion. That all ryhmes actually haha. Very cool blend there mate. Well done. I’m digging the concept too. ;-) Cheers Mark… now THIS is the one who you need to be worrying about – her and the body guard I’m planning…. Thanks ‘packer – funnily enough, I did agonise about those exact items! :-) A couple of things helped me to make up my mind. 2: The pistol can either be holstered (to use with the right hand) or even left off entirely – apparently Spiritseers have a ranged attack with their staffs in 40k, but even so, I’m not too worried about her being list-perfect. 3: More clothing was considered, but then discounted to better show the extent of her transformation. I may yet add a leafy loincloth, but only if it doesn’t dilute the overall feel of the piece. I see what you are getting at. Maybe if you just made the arm a bit more smooth? Then it would seem like more of a natural thing than “magic spiky”? Either way, paint will surely help! Definitely Win! I love the idea of wraith troops as well, going to be very interested to see how her charges turn out. Win, mate. Most definitely win. The different part blend very well and you managed to capture what describe in the text. Wraith guard and the likes are a very cool concept straight out of the box and the Exodite twist is new. I really like the idea of the Eldar breathing (un)life into trees. I’ll bring a flamer and some axes too. How do one go about sculpting fur? I need to do some shabby fur for a couple of beasts that will run with my Horrors of the Undergrowth Warband. Can’t wait! I might have to do some experimenting myself. So much win. Brilliant, creepy, weird and interesting! Damn, this is cool! You are coming with really interesting ideas here!! Interesting idea… and the model works pretty darn well, I think. Cheers mate, I’m really happy with how it’s going! Very nice so far. What occurred to me looking closely at the images is perhaps having some Eldar “soulstone bumps” on the tree-bark-body, to help unify the two concepts further. Not a problem. O’m looking forward to seeing how the modelling turns out, and then of course – paint!